Tomorrow, February 2, at 6:30 p.m., 11th District State Representative Bob Hasegawa will host a telephone town hall meeting for constituents to bring up any questions, comments, and concerns about legislative and other issues. The 11th District includes parts of South Seattle including the western part of Beacon Hill, Burien, Sea-Tac, Tukwila, and part of Renton. Just before 6:30 tomorrow evening, thousands of 11th District residents will get phone calls inviting them to participate in the town hall meeting by pressing “*3” on their telephones. If you don’t get a call and still wish to participate, you can call 1-877-229-8493 (toll free) and enter the PIN 18646 when prompted. 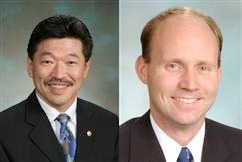 State Representative, Bob Hasegawa is going to tour our neighborhood this Friday, Aug 28th, at 1:00PM. We have asked Bob to come to see first-hand what City Light and ST have done regarding the massive power lines on Stevens St, and along 14th Ave.
We are going to meet at my house (3017 12th Ave S) at 1:00PM. If anyone would like to attend, and either meet Bob for the first time, or get a chance to catch up with him, this is a good opportunity. Hi! September 11 is the fall King County United Way Day of Caring. For the past two years, large groups of employees from Microsoft and other businesses have come to Dr. Jose Rizal Park and other sites to improve our common spaces. This year, we may have between 70 and 100 people volunteer at Dr. Jose Rizal Park, and so for the first time, I’ve got to admit I’m challenged. The two neighbors who’ve helped out so much in the past around this event have moved from Beacon Hill and aren’t available. Is there someone out there who could help get a couple of groups started on projects in the off-leash area? It would be great if a few neighbors turned out to help. I’d like to begin setting up at 9 AM that Friday morning, Sept. 11 – the event runs from 10 AM to 2 PM. The volunteers do the heavy lifting; most of what’s involved is laying out the tools, which we’ve purchased with grants, plus we’ll have some on loan. We’ll be making improvements to the entrance of the off-leash area terracing the slope along the east side of the park with materials already on site – the terraces will be planted later in the month by a smaller crew of volunteers. Email Craig at catzero9@yahoo.com if you can help out. 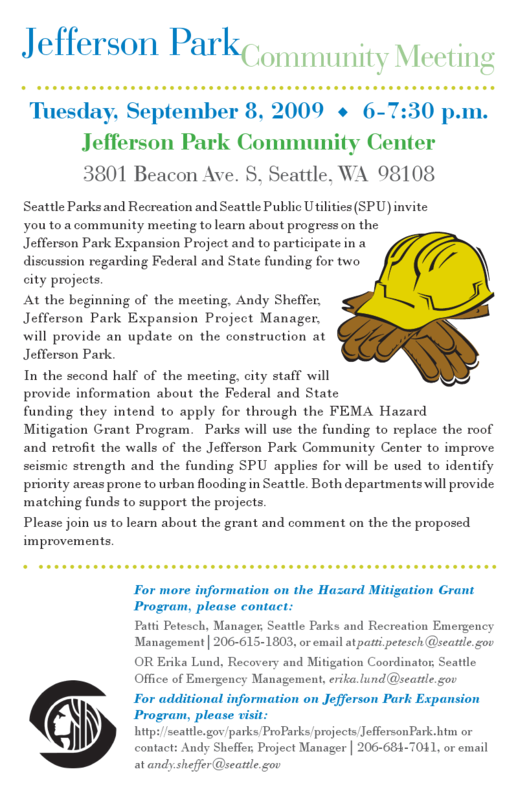 Seattle Parks and Recreation and Seattle Public Utilities are hosting a Jefferson Park construction update meeting, 6pm, Tuesday, September 8th, at the Jefferson Park Community Center. At the meeting learn about funding through the FEMA Hazard Mitigation Grant Program that the city intends to apply for and get an update on the construction at Jefferson Park. The first part of the meeting will be dedicated to Jefferson Park construction update and the second half will discuss the application for federal and state funding.